Managing a retail store means you’re familiar with a constant state of change – there are always displays to be updated or moved on a weekly or monthly basis. When it comes to retail store shelving, there are so many areas to consider, including design options, types of shelving, how to increase sales, and storage shelves. In this guide, you’ll find everything you need to know, whether you’re starting from scratch or redesigning a current store design. Is Wood or Metal Shelving Better for Retail? Ready to Improve Your Retail Shelving? As you prepare to install shelving for your retail store, what should you consider first? Budget is a major factor and ultimately the area to evaluate before you make any other decisions. Expenses may include rent, utilities, vendor payments, and of course, the shelving units. Creating a budget for shelving in the beginning is crucial because if you wait until later, you might run out of funds or you might end up with not enough shelving fixtures. Gondola Shelving – The most popular and versatile shelving option, it not only holds merchandise but can also be helpful for determining a store’s layout. This option also provides the ability to mix and match pieces. Countertop Wire Baskets & Racks – Fixtures such as baskets and racks for countertops will be helpful for offering last-minute purchases. Tabletop Display Fixtures – These fixtures allow you to feature special items, whether it’s seasonal or simply a high-volume item. Remember that your store’s layout should be continuously evolving – so it’s a good idea to plan for a full layout with all of the above, but you can also reconfigure as time goes on. Carefully planning for the types of shelves you want to use in your store is critical to the success of your floor plan and ultimately sales. Let’s discuss the basic options for several types of shelves. Slatwall Backed – This type of shelving is incredibly versatile and allows you to move shelving easily. These shelves are generally better for lighter items. Gondola Shelving – As mentioned above this type of shelving is the most popular to use and also works well to configure your store’s layout. It can also hold almost any type of item – from featured items to heavier merchandise. End Caps – Typically paired at the end of gondola shelving, they are usually temporary for holiday or seasonal items, but they can also be used to expand shelving. Wall Units – This type of shelving can be placed on empty walls in your store. This allows you to visually break up the space while keeping products visible for customers. Wall End Display Units – This type of unit is useful when you need to expand existing wall shelving, or you can use slatwalls or pegboards to hang hooks or baskets. A simple display case might work well for simpler items that do not require security or lighting. For higher end items, definitely consider purchasing high-end cases with focal lighting and secure locks. As we mentioned some items might require more security than others – higher priced items should be placed in a locking display case, while others can still be featured in a non-locking case. If you’re starting with all new cases – great! This is the perfect opportunity to choose a whole new style for your store’s fixtures. If you simply need to update a few pieces and add on to your current fixtures, make sure they blend in together as far as color, style, and material. Ultimately, it’s important to choose cases that will fit in with your store layout. Consider size and foot traffic to ensure that the display cases are a good fit for your store. Beyond the logistics of choosing retail shelving that makes the most sense for your store and items, creative shelving will appeal to your customers and make your merchandise look even better. Search online – The internet has a wealth of information and ideas. Visit stores in person – there’s no better way to get ideas than visit other stores. Gondola shelving has been a familiar sight in most retail stores. Strong, versatile, and indispensable, there are also many options when it comes to this type of shelving. For example, there are many color and accessory options that will allow you to create a cohesive atmosphere for your store. A glass display showcase has advantages and disadvantages, depending on your merchandise. This type of shelving is typically useful for perfume, cosmetics, and jewelry. Let’s learn more about the potential pros and cons. As you can see, it will depend on your store, merchandise, and staff to determine if a glass display showcase is right for you. Whether you’ve used one or both of these options in the past, it’s worth considering which type of shelving is best for your store. Many stores use metal shelving because it’s affordable, strong, easy to install, easy to keep clean, and easily adjustable to accommodate different types and sizes of merchandise. Metal shelving can also feature slat wall or pegboard backing, making it easy to accessories like hooks, hangers, trays, bins, and baskets. This type of shelving can also be appropriate in the right retail setting, such as pharmacies, clothing stores, jewelry shops, in addition to other retail spaces. Wood shelving can provide a unique and finished look for your store, plus you can typically find them pre-made or order custom-fit shelving. Other options include, the type of wood – oak and maple are popular choices and there are a variety of finishes that can be applied. 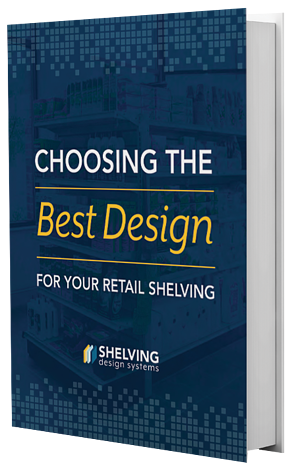 The type of shelving you choose all depends on your store, customers, and preferences. Wood shelving can create a warmer environment, while metal shelving can be a better for an environment like an automotive store. This type of shelving unit has many potential uses for retail stores. Both reliable and sturdy, this type of shelving can last for a long time. Stock Room - When you have a large amount of inventory, industrial steel shelving is ideal as it’s versatile and available in many sizes. One option using steel shelving includes carriage systems, which allow you to move shelves as needed. Warehouse Storage – For an even stronger option, heavy duty steel shelving can store heavy and large merchandise. They come in a variety of shapes, sizes, and dimensions. Product Display – This type of shelving is also uniquely durable and cost-effective for displaying your store’s merchandise. Evaluate the types of products you use and determine which might benefit from using steel shelving. If space is an issue in your space, whether it’s too much standard shelving or you’re running out of floor space, slatwall and floating shelves can be the perfect solution for you. Slatwalls are mobile shelving units made of thick wire mesh. This is a great option because they’re lightweight and they can easily be moved. Also available in different colors and sizes, you can choose the options that will work best with your design. Once slatwalls are in place, you can add floating shelves, an easy-to-install shelf that slides into the slatwall. Floating shelves are also incredibly mobile allowing you to make changes as needed. You might be thinking that all of these design options are great but – how do they affect the bottom line? In particular, wall shelving can help you move more merchandise. With the right display, you can feature your best items to customers, rather than let those products get lost in a poor display or messy floor plan. Aside from directing traffic through your store, the right display setup allows for a contrasting look will focus attention to the perimeters. Slatwall panel displays provide a versatile, efficient way to showcase different products. Wall display shelving can be used as a counterpoint to slatwall panels. Displays should also tie into the overall theme of your free-standing shelves. Whether displays are moveable or permanent, moving products around will prevent areas from becoming boring. Incorporating built-in lighting can also create a pleasing effect and draw customers’ attention to that area. Lastly, be sure to avoid clutter and promote a pleasing color and contrast between items displayed. Another key area to consider for retail shelving is the use of your stockroom. Whether your current shelving system isn’t working or it’s simply disorganized, here are a few basic principles to follow as you prepare to create a productive and efficient stockroom. Make sure the shelving system you choose fits your space. This might include choosing the correct size and construction, raising stockroom height for more storage in the same amount of floor space, or opting for mobile shelving. Create a stockroom shelving system that is flexible and customizable. It’s likely that your needs will change over time, so make sure that your stockroom can evolve as well. Be sure that it’s easy to track and secure current inventory. Your merchandise should be easily visible and easy to access for inventory counts or rotating stock. The above recommendations are only the beginning of best practices when it comes to storage space. When it comes to storage shelves for retail, it’s crucial that your store is as organized as possible. One way in which this can be accomplished is through racking and shelving systems. Let you go vertical – If your storage space is full, it might be time to go vertical. Not only do you have more storage space, but it can also reduce turnaround times. Increase storage density and efficiency – Drive-in racks are advantageous because they allow for denser storage of goods and they allow trucks to easily enter racks' structures to place and retrieve pallets of goods. Replace inefficiency of one-size-fits-all storage – With customized storage and picking systems, merchandise can be replenished large center aisle conveyors rather than replenishing with forklifts. Use technology to increase productivity – This not only cuts labor costs but also allows for quick merchandise retrieval and turnover. Allow for additions and expansion – Lastly, this type of storage system allows for flexibility and expansion as a store’s needs change. If you’re inspired to move forward with the next step in the design process for your store, reach out to Shelving Design Systems today to set up a free consultation.